This entry was posted in Privilege and Power, Public Discussion, Social Theory and tagged cultural appropriation, Halloween, power dynamics, social justice by athenakbrown. Bookmark the permalink. Well articulated. I was beginning to think the world was all going mad. I also love that you’re a feminist criticizing EF, which I have come to view as a hurt feelings factory. I am a feminist, too. I moved away from my home state of Alabama to get away from the racism, sexism, right-wing extremism, and rampant ignorance. But damn if some of the extreme leftist arguments these days don’t make me feel old and embarrassed to be labeled a liberal. You can’t cosplay as a black person! “Costume play” is for mimicking characters. Its a culture NOT a costume. To “costume play” as any culture to which you dont belong is belong is to create a caraciture of the people who do and indulge in your own ideas and assumptions about the nature and meaning of that culture. As a white woman she posseses enough power within our current socio-cultural landscape to expect success in such a venture. At the same time Africans in the western world (i.e. Europe, the US, etc.) are expected and ultimately forced by social pressure to shed the defining aspects of our own cultures and the difference it represents and adopt the cultural standards and beauty standards of the dominant cultural group (white people). I can’t wear traditional wear on the street because people stare and it garners unwanted attention. Realistically the color of my skin alone will do that. But as a white person you can say “this traditional wear is nice I’ll wear that” but not have to deal with any of the realities of actually being a person of color. Meanwhile black women and girls strive for whiteness by straightening our hair and bleaching our skin. Can you see how there’s a power dynamic at play? THANK YOU- you articulated everything I have been thinking while researching the topic, put it into a great little list with some awesome graphics, and really made a strong case for your argument. SJWs are making the internet a place where free speech is becoming increasingly less common, groupthink is rising, and it is just so refreshing to read a well thought out response to a ridiculous theory where the author is not silenced for fear of being called a racist. Thank you for this post! I posted an image of my class wearing Beijing Opera makeup and someone found it offensive, they said ‘cultural appropriation’. I had to research the term and examples of it because I never heard of it before now. The makeup was a part of our study abroad program and was approved by our Chinese teachers. Yet my picture was deemed offensive because we were wearing the makeup of the actors in the Beijing Opera. I still cannot see how it’s offensive, I see it as an appreciation of their traditional opera. There was no ill intent when wearing the makeup, to us it was simply learning and experiencing something new. As you said, “our car is German. Your vodka is Russian. Your pizza is Italian. Your kebab is Turkish. Your video games are Japanese. Your democracy is Greek. Your coffee is Brazilian. You don’t appropriate from other cultures. You **ARE** appropriated culture.” I’m still struggling to understand how it’s offensive, the person who said it was Chinese but she lives in America. So if that’s the case, then that must be mean she’s most likely doing things that can be qualified as ‘cultural appropriation’. In some cases, I can see how certain actions are offensive but in other instances I just see it as an appreciation for someone else’s culture. How is that wrong? Hey there Foreigndreams! Thanks for checking us out and commenting. For the most part, Cultural Appropriation isn’t actually a real thing. It’s a made up concept that allows people to get outraged anytime they see… well, anything. I work in mental health, and I’ve got my own idea as to why people do this. Extracting from Transactional Analysis theory, I believe that on some level, people enjoy being outraged. They like to play the role of the outraged social justice crusader, and standing up for the rights of the innocent. Concepts like “cultural appropriation” are just tools that allow them to put on their mask and cape and fight the system, whenever the mood strikes them. It also fulfills other dark emotions and roles that folks like to explore; such as being the unintended villain. Because we’re “oppressing other cultures”, they have a chance to feel downtrodden and remorseful. These are a spectrum of emotions that may be absent from the day to day life of an upper middle class person who’s well off. Either way, the person is getting something out of it. It’s enjoyable, it’s not a responsibility with set hours and expectations, they can do it anytime they wish, and they can later identify themselves as “fighting the good fight”. Mentioning this term in a conversation may help them look enlightened about social justice causes, so it’s even fashionable. That’s the hypothesis I would put forward for why people involve themselves with concepts like cultural appropriation. Thank you. Your response really helps to clear some things up for me. I was born in China to an American father and second generation “American-Chinese” mother. I studied Peking Opera in high school, and I loved it! I never once had a problem with it while I was in China, but when I moved to the US for school it was “cultural appropriation” AND I AM CHINESE! a caucasion “big nose” “cow eye” Chinese woman! It makes me so angry. Art is universal. Food is food. Clothes are clothes. Rosetta Tharpe is known as the woman who “created” rock n roll. She was a queer black woman. Way before Chuck Berry. Also gospel was first done by a black man and evolved, as a genre, from spirituals. African Spirituals. Gospel music and hymns are not in the same category, hymns have specific musical guidelines that make them hymns.but either way, gospel was not birthed from church hymns. “white” ppl DONT have any original music, because we are all from europe. an Irish/Italian american (for example) may have music authentic to their ancestors, but as the group “white”, we have nothing. race is a construct, ethnicity actually exists. 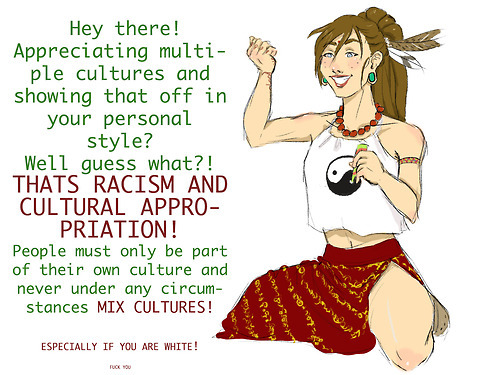 so, as the “white race”, yes, all of our “white culture” is an appropriation from actual ethnic cultures. All we really do have as our own is White Supremacy. Thats our contribution. Our country was founded and built on it. Werent you referencing making use of history books? maybe you should get on that yrself. and yr high schoool textbook doesnt qualify. ok, also, you gave an false (or just completely self made) definition of racism. so, before one can legitimately delve into any of these topics, a proper understanding of the word being used is a necessity. showing you dont have a clear understanding on the working definition of racism invalidates anything and everything you said after that point. You became an unreliable source there. We arent having peaceful relations with China because chinese letter tattoos are common among americans or any other social reason you gave that you claim make Chinese ppl more acceptable to us. World trade deals and now our huge monetary debt to their government is why we play nice with the Chinese. its economics. 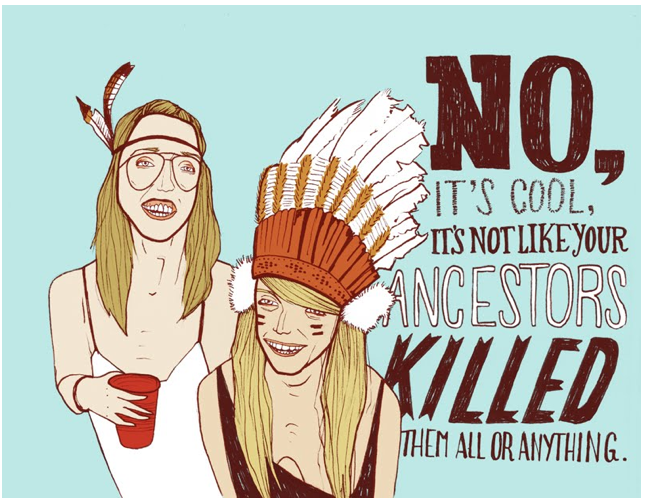 and finally, denying that cultural appropriation exists doesnt make it not real. I think you just dont understand what it actually is. Also, if a group of marginalized ppl say that white people are culturally appropriating them, as the white ppl in the equation we dont just get to dismiss it. Thats an example of our white supremacist system full at work on the brain. If I claim someone is abusing me, the abuser doesnt get to decide whether or not its true. if Im feeling harassed by someone, the harasser cannot with any validity decide its not true. I would decide what constitutes harassment and abuse to me. So, when ppl of these different groups say they are being culturally appropriated, they validate it, not the group being accused of doing it. Its not a term somebody thought up in their basement with no valid, legitimate explicit definitions and examples of it. Critical thinking skills need to be developed and then used in areas such as this. You are picking yr “sources” to get the answer you want. Like, use the gd dictionary to define feminism, not some blog or w.e. yr attempting to frame the narrative from the go. and go ahead i guess, because you sound ridiculously silly and uninformed. ALSO, every country you gave an example of on where cultural appropriation isnt “a thing”, they are all countries filled with WHITE SKINNED PPL.with the exception of the indigenous ppl of Australia (which i doubt you were referring to), and they are treated horribly by Anglo-Austrailians-oh- another country that imported all of its white skinned ppl. Look at that! so, how old are you is the real question. because you better not be too old for this ignorant bs. I hope yr hubris and ignorance are just a piece of you being without much real life experience. And thats ok! But you sound ridic. if you really cant see the difference between mixing of cultures in a productive, reciprocal manner where neither party feels used and there is mutual benefitting or just the natural blending that happens over time and actual cultural appropriation, read about it. BOOKS about it, first hand sourcing, secondary sources, scholarly cited journal articles. If for no other reason than to beef up yr position to even have a position and not sound like a 16 year old brat. good luck. and in any legal dispute in such a case, you wouldn’t get to decide either. it would be decided by an independant judge (and some circuimstances, jury. just because you decide you have been unfairly treated, doesn’t mean you HAVE been unfairly treated. it’s great fun that you ended such a blatant ad hom attack with slang that betrays a lack of maturity in yourself.